Hinshaw, William, head-of-household, age 37, born June 1862 in Indiana; father born in North Carolina; mother born in Indiana; married 15 years; occupation: farmer; owned farm (mortgaged). Hinshaw, Effie V., wife, age 34, born Aug 1865 in Indiana; father born in Pennsylvania; [mother's birthplace blank]; married 15 years; 7 children, 4 living. Hinshaw, Zellie O., daughter, age 14, born Dec 1885 in Indiana; parents born in Indiana; attended school 6 months. Hinshaw, Goff G., son, age 10, born Aug 1889 in Indiana; parents born in Indiana; attended school 6 months. Hinshaw, Mary E., daughter, age 6, born Aug 1893 in Indiana; parents born in Indiana. Hinshaw, Cora W., daughter, age 8 months, born Sept 1899 in Indiana; parents born in Indiana. Hinshaw, Wm H., head-of-household, age 47, born in Indiana; father born in North Carolina; mother born in Indiana; first marriage, married 25 years; occupation: farmer; owned farm (mortgaged). 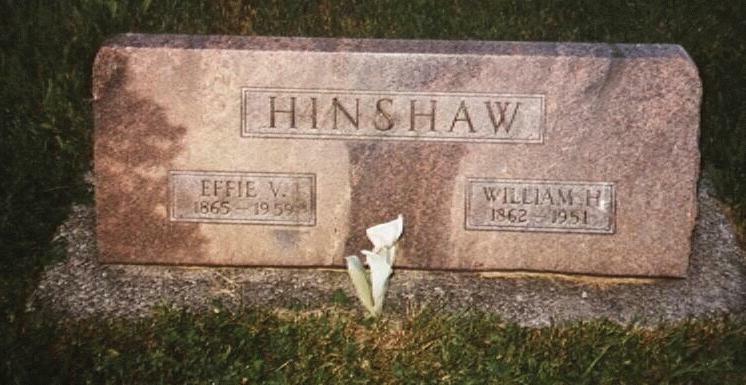 Hinshaw, Effie V., wife, age 44, born in Indiana; father born in Pennsylvania; mother born in Virginia; first marriage, married 25 years; 8 children, 4 living. Hinshaw, Goff, son, age 20, born in Indiana; parents born in Indiana; occupation: farmer, home farm. Hinshaw, Mary E., daughter, age 16, born in Indiana; parents born in Indiana. Hinshaw, Cora W., daughter, age 10, born in Indiana; parents born in Indiana; attended school. Hinshaw, Henry Howard, son, age 5, born in Indiana; parents born in Indiana. Hinshaw, William H., head-of-household, age 57, born in Indiana; father born in North Carolina; mother born in Indiana; owned home; occupation: farmer, general farm. Hinshaw, Effie V., wife, age 54, born in Indiana; father born in Virginia [unclear]; mother born in Indiana [unclear]. Hinshaw, Henry H., son, age 16, born in Indiana; parents born in Indiana; attended school. Hinshaw, William H., head-of-household, age 67, born in Indiana; father born in North Carolina; mother born in Indiana; first married at age 23; owned home; no radio in home; occupation: farmer, general farm; not a veteran. Hinshaw, Effie, wife, age 64, born in Indiana; father born in Virginia; mother born in Indiana; first married at age 20. Hinshaw, William, head-of-household, age 77, born in Indiana; completed 7th grade; on Apr 1 1935 was living in rural Hamilton County, Indiana; rented home ($5/month rent). Hinshaw, Effie V., wife, age 74, born in Indiana; completed 7th grade; on Apr 1 1935 was living in rural Hamilton County, Indiana. 1930 census, Clay Township, Hamilton County, Indiana; roll T626-590, ED 5, page 6B, line #53, dwelling #165, family #165. 1940 census, Jackson Township, Boone County, Indiana; roll T627-1028, ED 6-17, page 5B, line #59, household #112. Indiana Marriages, 1845-1920; http://www.ancestry.com (Book 7, page 212).